Many dogs and cats across the country are living in animal shelters and humane societies, desperately waiting for someone to adopt them and take them to a new home. Unfortunately, waiting for an adoption can take a long time for homeless pets. Many shelters and humane societies have begun the process of looking for volunteer foster families willing to take the pets into their homes for a limited amount of time. People that may be potential foster families often fear that they will become too attached to the foster pet and will have difficulty returning it to the shelter or humane society. While it is true that foster families often do become attached to the pet during the time spent together, they can take pride and satisfaction in knowing that they have provided a loving and stable environment for the animal. Other potential foster families worry about the behavior of the foster pet with their family members or with pets already in the home. There could indeed be clashes of personality between the foster pet and existing family members or pets, but most animal shelters and humane societies try to place pets in homes that will be the best match of personalities. Despite these and any other fears, inviting a foster pet in the home can produce many benefits for both the pet and the family. Fostering a pet can be one of the most rewarding opportunities that a person or family can experience. Both the foster family and the pet can benefit from a unique and nurturing situation when a dog or cat is invited temporarily into the home. Through the time spent together and the bonds that are formed, foster families have the ability to change and save the life of a dog or cat. Lauren Colman serves as the digital marketer for the dog boarding and dog sitting community at Rover.com and is a true dog lover at heart. Lauren spends her days at the office with her dogs Squish and Brando by her side. You can follow Rover.com on Twitter @roverdotcom or on their blog, Dog Boarding News. since he bit the tip of Max’s ear off, I’m wicked hesitant to have a foster LOL! But thank you!!! btw, can I talk to you about his blood work results? heh – Snick did that to a foster dog once. They were finally besties after that. I think that fostering helps a dog become more adoptable. 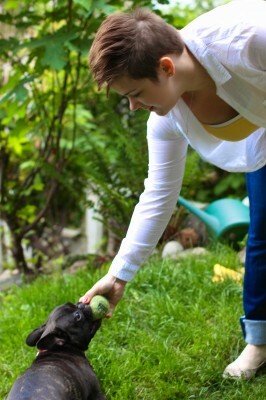 Being in a home environment the dog can learn basic skills and the way things go on in a home. That may help them be more relaxed when potential adopter comes to meet him/her. A big shout out to all the people who foster! You’d be surprised what you can do when you put your mind to saving animals. Yes, there will be some that you just can’t let go (or you cry your eyes out over when you do – I’ve been there and done that). BUT knowing you are saving a life every time you foster is SO TOTALLY WORTH IT! Loved your article. So did my foster pup Chance and my co-foster pup Jenny. That another point to share with people is that they can share the responsibility and the fun. Chance is in my home and part of my family. Jenny is homed with a friend and I am responsible for promoting her on-line, taking her to adoption events hence the label of “co” foster. A note to Jessica… I have a few “foster” failures i.e. fosters that never left and NO complaints. I did recently let go of three cats and a puppy Rudolph as I will let go of Chance because I know they’ll have a better home and more attention elsewhere then I can give based on my busy fur-filled home. Don’t be concerned about not being able to let go. We have to be concerned about the ones that are put down because they have no foster home to take them. What are your thoughts on fostering for first time dog owners? I am researching about pet ownership and all the responsibilities that come with that, and I will be a first time owner. It occurred to me that fostering could be a nice way to learn about shibas. I know my own temperament and lifestyle, and it seems like a good fit — but then again, I am constantly reading that shibas are not a great choice for the uninitiated human. Then, there’s also the aspect of foster dogs themselves: are they inherently (possibly) “more difficult” because of past ownership and/or abandonment issues? Part of a Foster’s responsibility is to work with the dog to help it become comfortable and adoptable, learning basic manners and skills. I would think this is something best left to people with ownership experience. What do you recommend? Fostering can be a great introduction to the breed and to dog ownership in general. It is true that Shibas – Shiba puppies in particular – are not a good breed for inexperienced dog owners. One benefit of fostering though CAN be getting an adult dog with a known temperament. Yes, some foster dogs are more difficult in general – in need of training or retraining, medical care, etc – however, just as many are dogs simply displaced by unfortunate circumstances. If you work with a reputable rescue organization who acknowledges your lack of experience and is willing to work with you, they can place a calm, mature foster dog in your care. You can grow as a foster and potential dog owner by learning from your foster dogs.